NAB Show is just around the corner , and the excitement is building as many manufactures are announcing various tech products. There are plenty of cameras , and support gear on hand, but what about post production? Well there are plenty of rumors of Intel’s new chip set Ivy Bridge, combined with the touch screen Ultrabook. Will I get to see one at NAB? The reason I am so interested in these new Ultrabooks, they are powerful and compact. This makes them ideal for working with post production on the field. Especially since newer high definition cameras are getting better at compression, allowing them to record to smaller media such as compact flash, and SD cards. 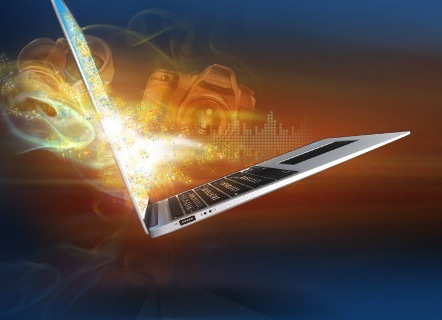 These latest generation of Ultrabooks have been rumored to include Intel’s latests graphics card HD 4000. These graphic cards seem packed with more power and efficiency, perfect for editing. When you look at the rumored specs, the Ultrabook starts sound like a great place to start an offline edit, or even take a look at dallies before jumping into the edit suite. This could save me some precious time as deadlines get shorter and shorter. I will be stoping by the Intel booth as I did last year to check out their latest offerings. But it will also be interesting to see what other manufactures, and post-production software have done with these Ultrabooks. Can these Ultrabooks run Avid or Adobe for instance? Will I be able to connect to my raids via USB 3.0 for fast transfer times. Will this new Intel HD 4000 graphics card be powerful and enough to edit and play games with? These are all questions that will most likely get answered at NAB. I will most definitely be checking out the various booths to see how the Ultrabook can fit into a modern edit suite. Be sure to stay tuned here, as I will be following up from NAB for all your tech and post production news.